Just when I was so proud of how regular I'd gotten with my posting - I've totally slacked this week. As you might be able to guess, the reason is staring you in the face! I've been quite busy at work planning this season's IFB Conference. This is my fourth one and I can't quite believe it! I'm proud to say we've got a pretty bang-up roster of speakers, and it's shaping up to be a fun, informative, lively and fast-paced event once again. Not to push my own motivations on you, but if you're going to be in NYC around NYFW and you're a blogger or work for a fashion / media company, you should look into snagging a ticket. Plus, I'll be there -- which should be reason enough, right? Le Swoon! I have yet to attend a "Blogging" conference, and don't think it is going to happen this year either... but WHAT. A. LINEUP! Looks fab! 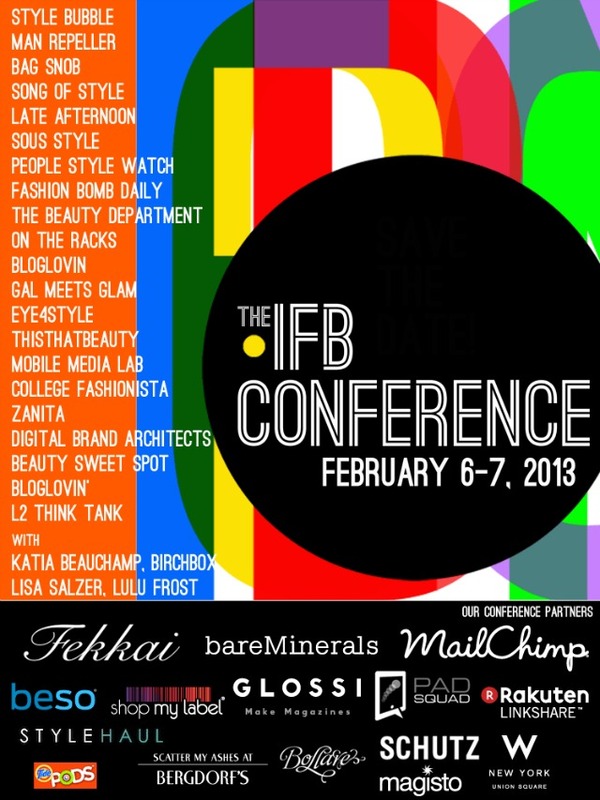 I am dying to go to IFB one year! I was actually planning on going to this one specifically but apparently having a due date on feb 4th. and flying anywhere near that time isn't advisable. Maybe in September?! Hope you guys have a BLAST!